The HSM SP 50100 is an extremely high performance conveyor belt document shredder combined with convenient baling press (HSM FA 500.3 shredder and HSM KP 100 baler). The HSM FA 500.3 shredder is a specialist 3-Phase Cross Cut Bulk Destroyers for Continuous Operation at Large Departments and Archive departments as Central Shredding Points. Material intake via large loading table and electric conveyor belt, or optionally via inclined conveyor belt and preshredder. Direct transfer of the material to be shredded to the downstream baling press. Keypad control for constant operation and reverse as well as automatic reversing in the event of a paper jam. Integrated, manual oiler for cutting unit. Modern SPS controller with multilingual display and convenient menu navigation. Photoelectric cell for automatic control of the pressing process. Shredding and pressing conducted simultaneously. Press with inspection door (dimensions 475 x 500 mm) and separate filling opening. 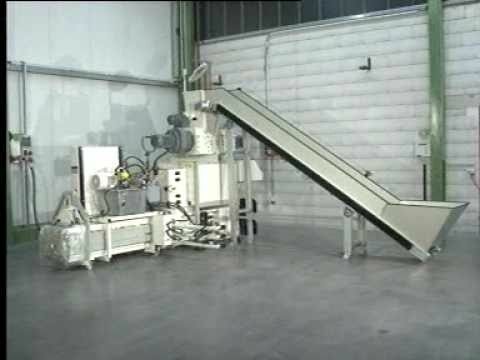 Fully automatic 3-fold strapping technology with patented winding technique and integrated polythene bag attachment (basic equipment: 5 plastic bags). A display will indicate when the SP 50100 machine has finished baling.